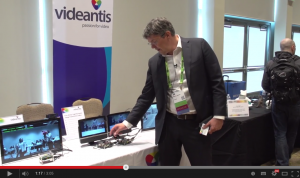 At the May 2014 Embedded Vision Summit West, we demonstrated our embedded vision products for automotive, mobile and home applications. In these demonstrations, we’re showing our pedestrian detection implementation running on the videantis v-MP4000HDX multicore architecture. In addition, we’re demonstrating feature detection combined with optical flow, and our low-delay H.264 High Intra automotive Ethernet AVB codec. For more details on HOG, watch our tutorial on histogram of oriented gradients for pedestrian detection at the show. View the demonstration video on the EVA website.